Where River and Prairie Meet the SKY!! 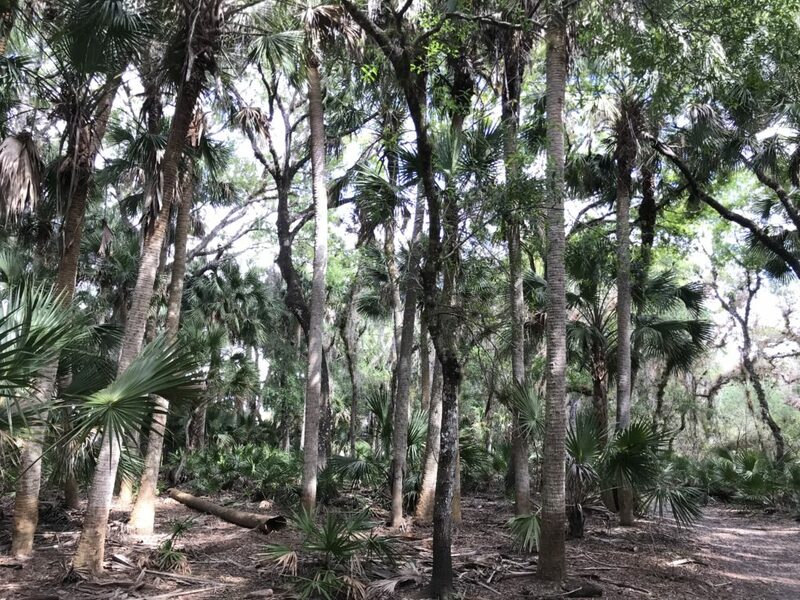 While in Ft. Myers, we visited Myakka River State Park twice. The first time we just drove through for a quick visit and decided this place deserved it’s own day! The park had lots of activities available and the landscape was different from much of what we had seen thus far in Florida. 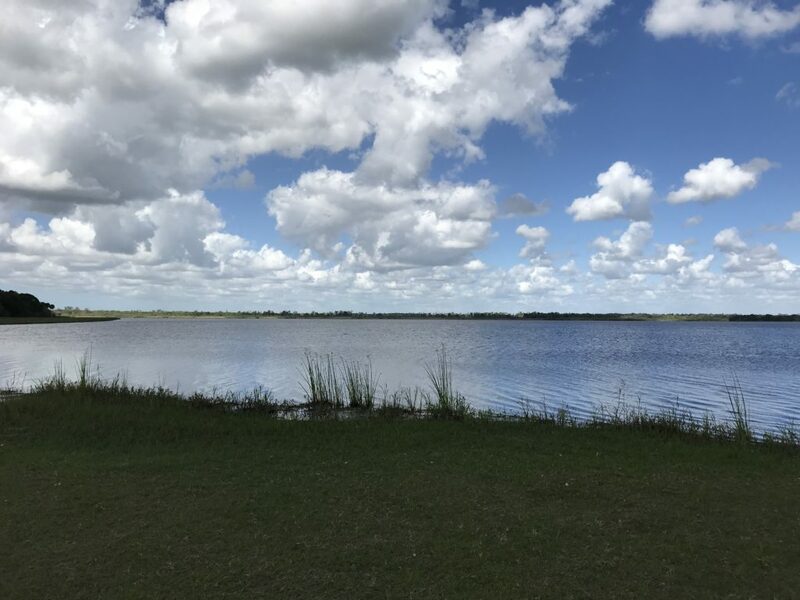 The park had both the Myakka River and a large lake, the Upper Myakka Lake. There was lots of open prairie land for some vast views. There are large expanses of rare Florida dry prairie here. 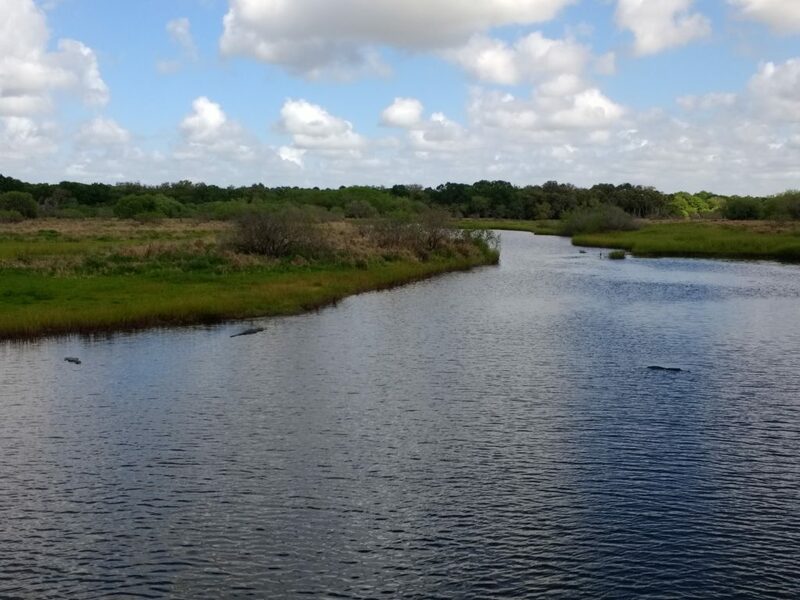 The Myakka River flows through 58 acres of wetlands, prairies, hammocks and pine lands. There was a 7-mile scenic drive which we did on our bicycles. On our bike ride we saw this snapping turtle crossing the road. There are 39 miles of hiking trails in the park and several dirt roads that provide access to more remote areas. The vegetation on the forest floor is lush and green. At times we felt like we were walking through a jungle. 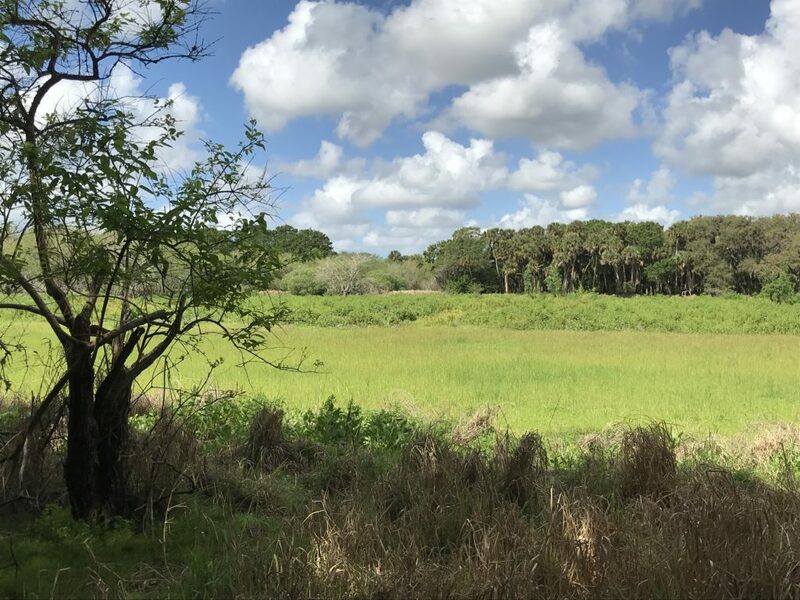 As we walked through the dense forest, we came to a grassy opening overlooking the Myakka River. We talked with 3 gentlemen that were out geocaching. They told us that there were over 500 caches in this park alone. The cache they were looking for was out on one of the observation platforms at the end of a boardwalk. After a bit of a hunt, the microcache was found hanging on a chain over the edge of the platform! There is an air boat tour on the lake. We watched people load up and go out on the Upper Myakka Lake. The boat was really loud! It is one of the two largest air boats in the world! 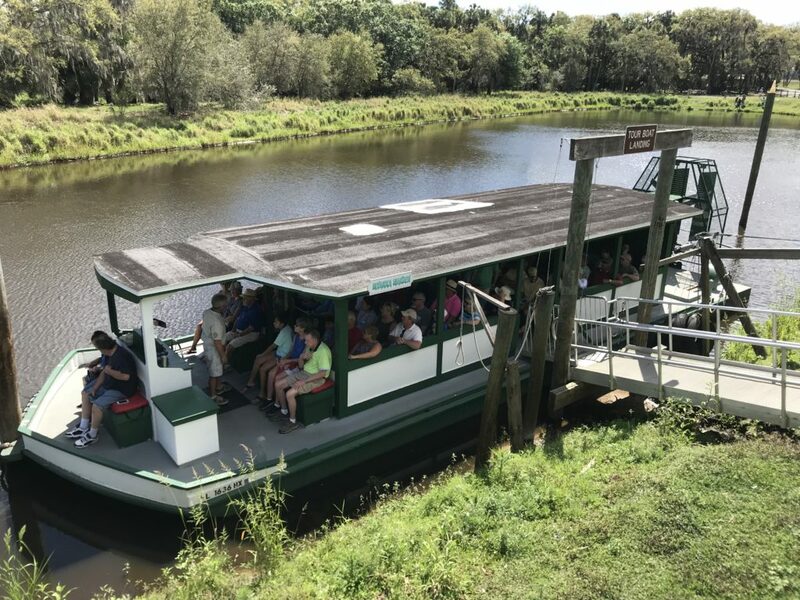 The boat tour starts at the Myakka Outpost, where you will find a restaurant named the Pink Gator Café. Yes, they serve ‘gator’. We didn’t eat there, but it was quite busy. You can also rent canoes and bicycles at the Outpost. There are 90 campsites that consist of three separate loops that a placed around the lake. Each loop has a bathhouse. We drove through the campgrounds and found them to be quite nice. We would like to camp there someday. The hosts told us it stays filled up constantly from November to March with snowbirders! There are lots of birding activities and this area is a favorite stop for birders. We saw sand hill cranes, an eagle, herons and anhingas. The park is also known for it’s abundant alligator population and alligator viewing is high on the list of things to do here. 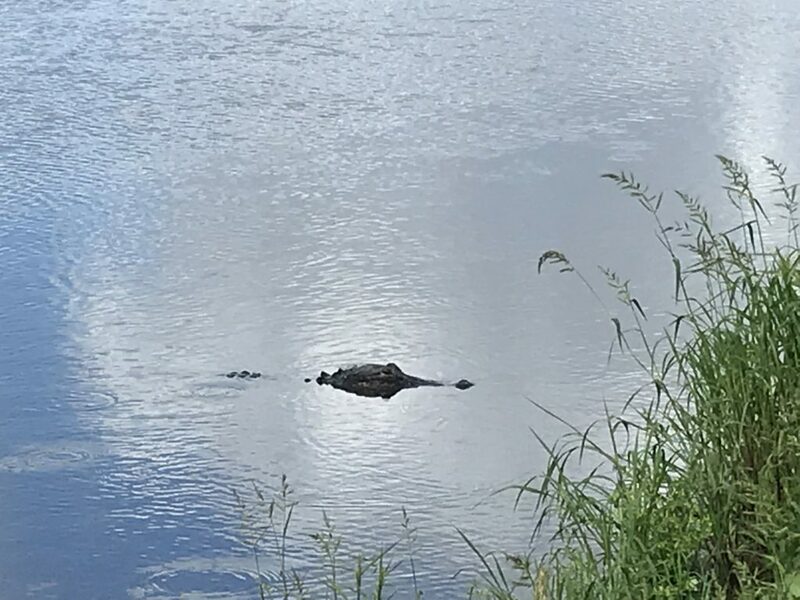 There is a small bridge over the Myakka River and both times we were there, we saw alligators lounging along the shore line as well as in the water! The picture above was taken from the bridge. They are fierce and ugly looking creatures. The alligator above we saw while we were hiking along the Myakka Lake. He wasn’t too far from us and some other people. He seemed to be keeping a close eye on everyone. A Walkway through the treetops! 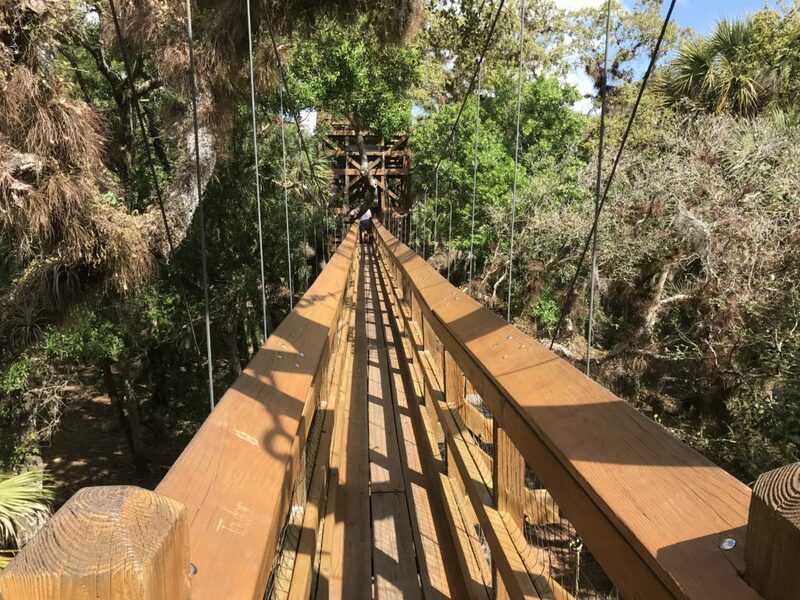 One hike we took was to the Myakka’s Canopy Walkway. There are only about 14 canopy walkways in the world according to the information sign and though this was a short walk, it was fun. This walkway requires a climb up the stairs, then a traverse across a swinging bridge. The swinging bridge is 25 feet above the ground. 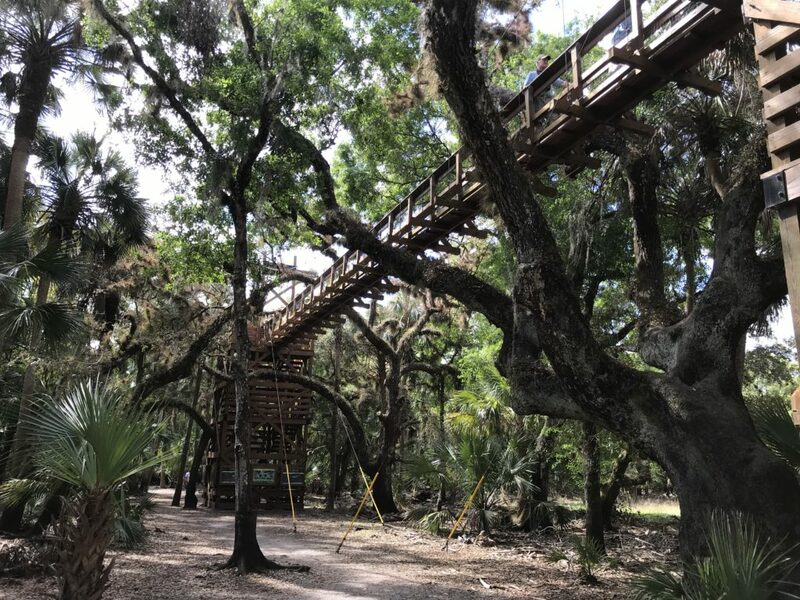 You can then finish the climb up a 74 foot high tower for an impressive view of the canopy including wetlands, forest and prairie. 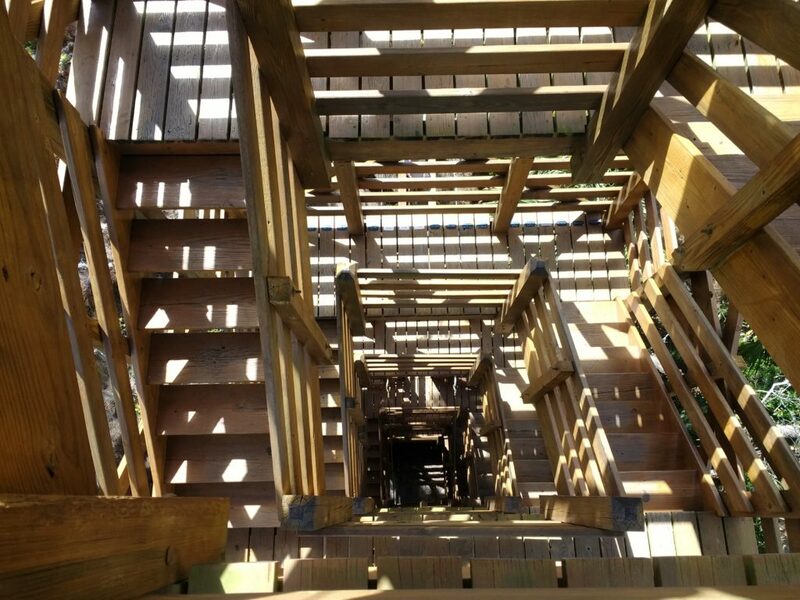 This is what is looks like looking down the tower. Now matter which way you look, there is an awesome view of the wetlands, forest and prairie. Below is a panoramic shot. 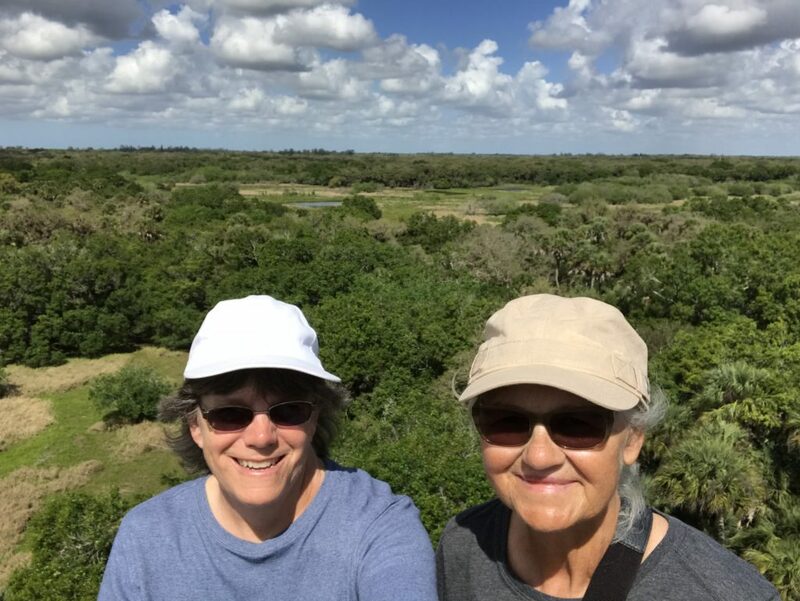 We really enjoyed our day visit to Myakka River State Park. We have this park on our list of places we would like to camp at the next time we decide to snowbird in Florida! Check it out if you get the opportunity! 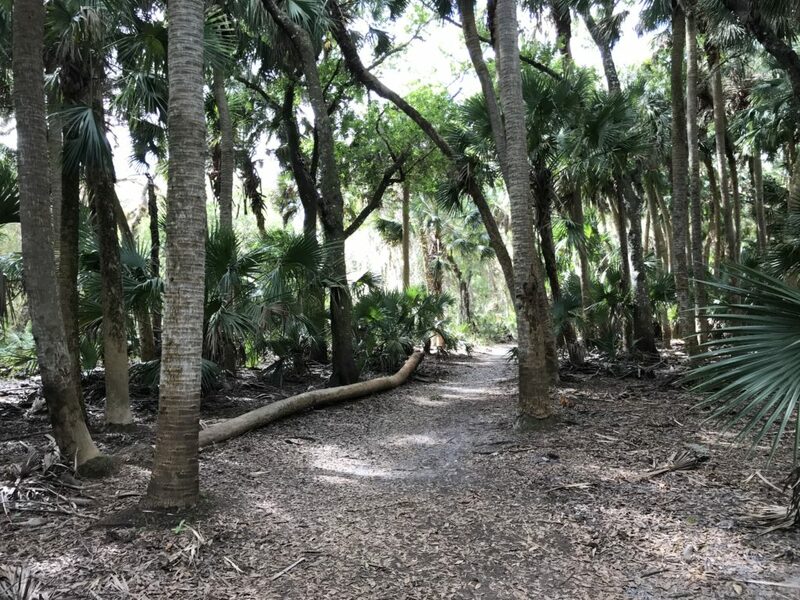 This entry was posted in Florida, State Parks and tagged Myakka River SP. Bookmark the permalink. Wow AWESOME! I need to check that lake/ river out!! 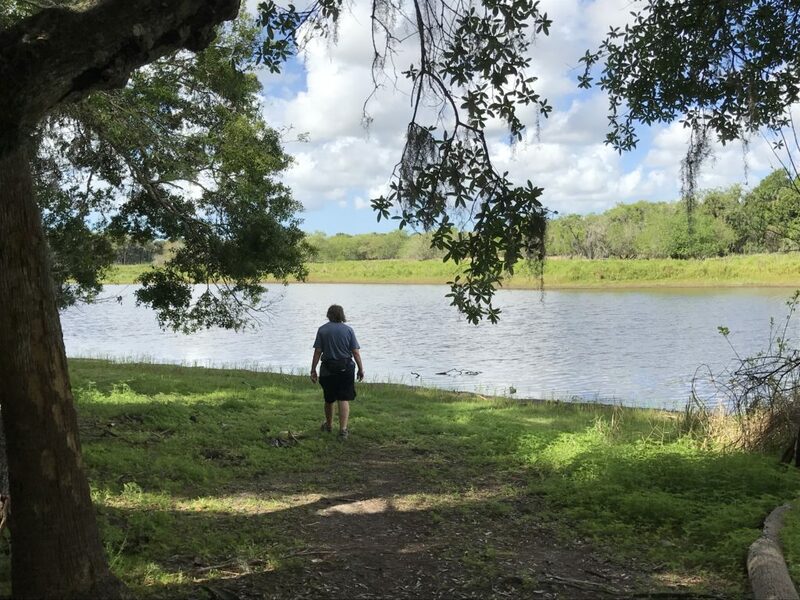 Yes, Myakka River is a very nice park. But soon you’ll be having your own adventures in Florida! What an exciting time! Put this park on your list for visiting next year. Hate to nitpick…but that is a soft shell turtle crossing the road…I used to trap them and snapping turtles as a kid. Correct me if I’m wrong…or ignore me which is what I’d do. It’s on my someday list. Thanks, Laura. We’re so happy that our someday is now!